Skutt has been an industry leader in the evolution of kiln form, function and design since building their first kiln in 1953. That first lightweight kiln revolutionized the ceramic industry by bringing ceramics directly into the home. With the introduction of the computerized KilnMaster controller in 1996, Skutt did it again by combining maximum ease of use with precise temperature control. That precision led in turn to the development of Skutt glass kilns, which are rapidly becoming the industry standard in their area too. Most recently, after many years away, Skutt re-entered the business of pottery wheels by hooking up with Thomas Stuart Potter's Wheels. Thomas Stuart had a reputation to match Skutt's, as making the best products in their market. It was a natural pairing, and now you can think "Skutt" for potters' wheels too. We have years of experience in working with artists, electricians, architects and others to make sure that your new kiln's specifications match your power supply, wiring requirements, local building codes, and other requirements. We'd be happy to work with you too. Our knowledgeable technical support staff is ready and able to answer any questions you might have. Excellent parts availability: we have many in stock. Skutt is located right here in Portland, so we can get the rest quickly when you need them. Great prices and availability: we are one of Skutt's largest distributors. 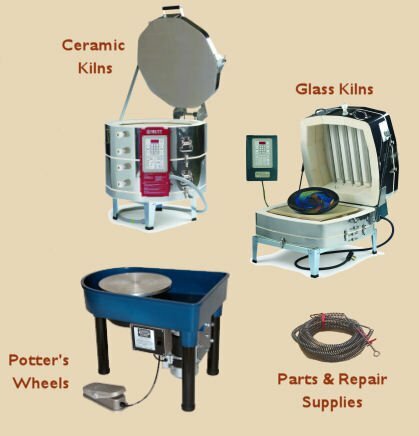 We have kilns in stock and in our store so you can examine them before choosing which one will be yours.